After enjoying declines in business failures from 2015 to 2016, Ireland is forecast to see a 2% increase in insolvencies in 2017 due to highly-leveraged public and private sectors and heavy dependence on FDI. The volatile environment and the potential shock from the Brexit may be lending to the expectations of an increase in usage of credit management tools by Irish respondents. After Denmark (56.4%) and Greece (52.1%), Ireland has the highest average of sales made on credit terms (48.2%) in Western Europe. Moreover, there was an increase in sales on credit terms in Ireland this year. According to responses in the country, 49.7% of the total value of sales to domestic B2B customers was made on credit terms (2016: 47.2%). 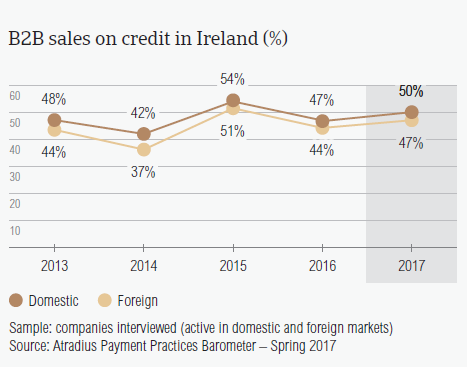 Irish respondents also reported more sales on credit terms to foreign B2B customers this year (46.7%) than in 2016 (44.4%). Across the Western European countries surveyed, there is a greater tendency to offer trade credit to domestic B2B customers than to foreign B2B customers. Ireland is no exception, however, the percentage of B2B domestic sales on credit terms is only slightly higher. While the percentages of sales on credit terms reported in Ireland were in line with the regional averages in 2016, this year, they are significantly higher than in Western Europe (domestic 42.6%; foreign: 35.1%). Late payment of invoices occurred more often in 2017, with Irish respondents reporting increased percentages of overdue invoices from both domestic and foreign B2B customers. An increased percentage of Irish respondents (95.5%) reported to have experienced late payment from their domestic B2B customers in 2017 than in 2016 (92.4%). The percentage shows a higher frequency of late payment in Ireland than in Western Europe overall (91.4%). In respect to overseas customers, the frequency of late payment in Ireland decreased from 88.5% in 2016 to 86.8% this year. Once more, this percentage is higher than that in Western Europe (84.2%). About half of the payments reported late in Ireland turned into overdue invoices (45.5%). This is more than the 41% regional level. The Days Sales Outstanding (DSO) figure in Ireland decreased from 52 days last year to 49 days in 2017. This is five days longer than the regional average of 44 days. Asked about expected changes in their company’s average DSO, most Irish respondents (55.7%) indicated no changes. According to 22.3%, there might be a slight increase while 13.9% lean towards a slight decrease. Payment delays by domestic and foreign B2B customers of respondents in Ireland increased this year compared to one year ago. 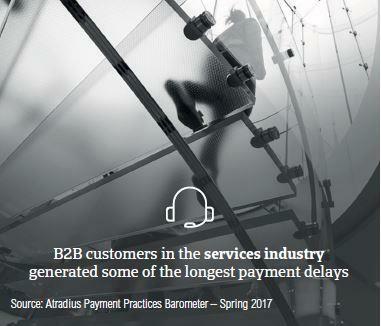 In 2017, domestic B2B customers were given longer average payment terms to settle their invoices (32 days). This means that compared to 2016, they had three days extra to settle their invoices. On the other hand, the average payment terms for foreign B2B customers were shortened from an average of 30 days in 2016 to 28 days this year. The average payment terms in Ireland are almost in line with those registered at regional level (domestic: 33 days; foreign: 31 days). The increase in domestic average payment terms was also observed in Western Europe and may suggest that respondents’ believe that domestic payment risks are increasing. 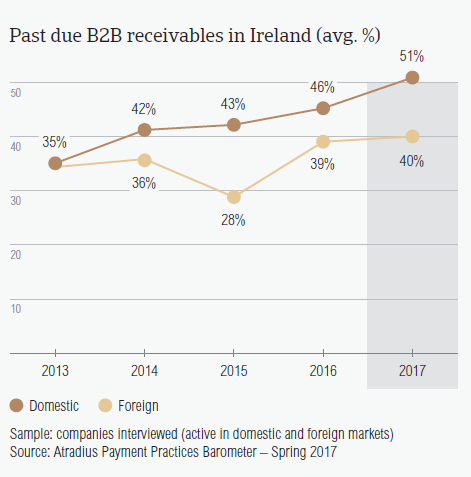 Domestic B2B customers of Irish respondents settled their payments, on average, 29 days after the invoice date, while foreign B2B customers took 24 days on average. This shows an increase in payment delays compared to last year (domestic: 25 days; foreign: 18 days). Respondents in Ireland need to wait 57 days (two weeks longer than in 2016) to turn B2B credit sales into cash. Irish respondents said that payment delays were primarily caused by insufficient availability of funds. This delay factor was stated by a higher percentage of respondents in Ireland (domestic: 59.3%; foreign: 37.3%) than in Western Europe (domestic: 52.6%, foreign: 34.5%). Secondary to liquidity issues, suppliers in Ireland said that their domestic B2B customers delayed payments because of buyers using outstanding invoices as financing (26.3%) and the complexity of the payment procedure (21.9%). In respect to key payment delay factors affecting transactions with their overseas customers, the second most often cited reason was the complexity of the payment procedure (34.1%). This was followed by inefficiencies of the banking system (22.2%). Payment delays by domestic and foreign B2B customers appear to have caused 17.5% of respondents in Ireland to lose revenue. This is higher than the regional average of 15.3%. 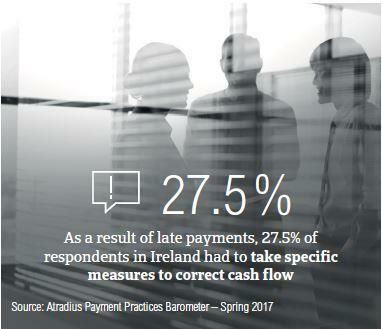 27.5% of respondents in Ireland stated that because of late payments by their domestic and foreign B2B customers they needed to take specific measures to correct cash flow. Once more, on average respondents in Ireland seem to be more affected by this than respondents surveyed in Western European overall (19.8%). 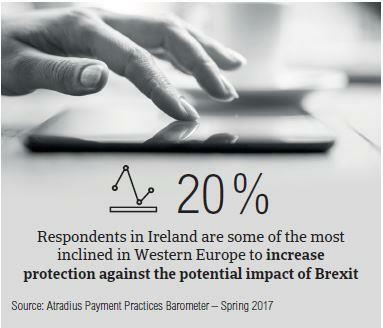 Respondents in Ireland seem to be the most concerned about the impact of Brexit and therefore more inclined to increase protection than their peers in Western Europe. The slowdown in Asia and US protectionism seem to prompt fewer respondents to take action. Fewer respondents in Ireland (42.9%) than in Western Europe (48.3%) said that they will not change their current mix of credit management tools to protect their businesses against the risks of payment defaults. On the other hand, 20.3% said that they are likely to take more action, with checking buyers’ creditworthiness (28.4%) and monitoring buyers’ credit risk (26.4%) being the most likely actions. The credit management tools chosen by the most Irish respondents in respect to the potential shock of Brexit are checking buyers’ creditworthiness (36.7%) and monitoring buyers’ credit risk (34%). Both these percentages are significantly higher than those in Western Europe overall (increasing creditworthiness checks: 24.4%, monitoring buyers’ credit risk: 20.9%). Irish respondents appear less concerned about taking action against the impact of US protectionism (increasing creditworthiness checks: 27.9%; monitoring buyers’ credit risk more often: 22.1%) and the slowdown in Asia (increasing creditworthiness checks: 20.8%, monitoring buyers’ credit risk more often: 23.2%). 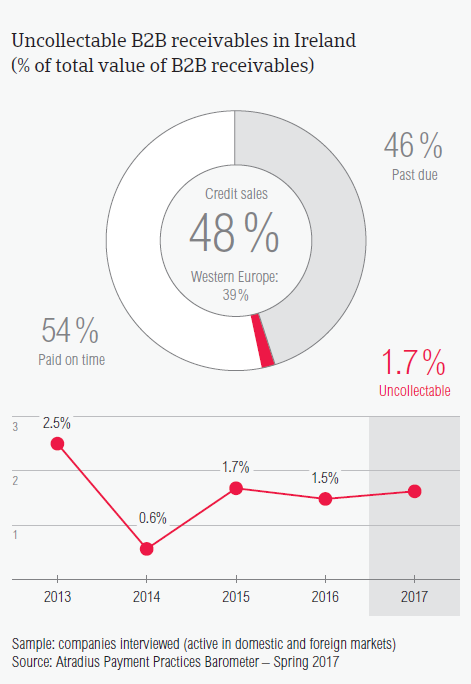 The total value of B2B receivables reported by suppliers in Ireland as being written off as uncollectable (0.8%) is slightly higher than the average for Western Europe overall (0.6%). Domestic receivables were written off as uncollectable more than twice as often as foreign ones (domestic 1.2%, foreign 0.5%) and more often than what was reported in Western Europe overall (domestic 1%, foreign 0.3%). Uncollectable B2B receivables originated most often from the construction, agriculture, consumer durables, services and business services sectors. B2B receivables were reported to be uncollectable mainly because the customer went bankrupt (55.4%), the high costs of pursuing debtors (36.1%) and failure of collection attempts (33.6%). 26% of respondents in Ireland expect a slight improvement in the payment behaviour of their B2B customers over the coming 12 months (Western Europe: 7.6%). 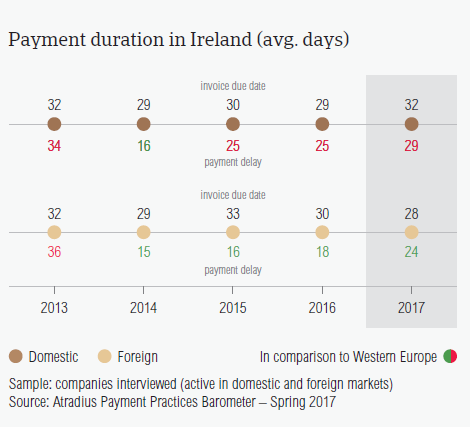 Respondents in Ireland granted payment terms longer than the 30 days country average to B2B customers in the metals (37 days), construction (36 days) and financial services (33 days) sectors. B2B customers in the textiles (17 days) and construction materials (22 days) industries were requested to settle their invoices much faster. Payment delays were mostly reported in the services, construction and consumer durables sectors. More specifically, on average, B2B customers in these sectors paid 62 days, 55 days and 41 days after the invoice due date. Irish respondents said that B2B customers in the construction sector delayed payments mainly because of liquidity issues (52%) and the buyers’ use of outstanding invoices as a form of financing (41%). The same reasons were stated in respect to the services sector (liquidity constraints: 67%, buyers’ use of outstanding invoices as a form of financing: 33%). The main reasons for payment delays in the consumer durables industry were liquidity constraints (52%) and inefficiencies of the banking system (44%). 54% of respondents in Ireland (Western Europe: 58%) do not expect changes in the payment behaviour of their B2B customers over the coming 12 months.